Image from Rhizomática Wiki  used under a Creative Commons license. 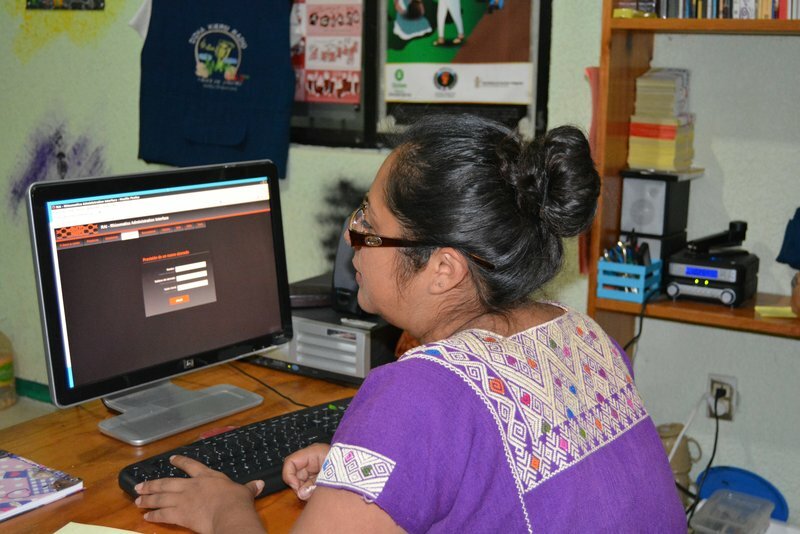 Indigenous Community Telecommunications  (ICT), a civil society association in Mexico, has withstood an important legal battle  for the right of indigenous communities to establish and manage their own community networks of mobile phones and internet. ICT, which provides voice and data  services at affordable costs in remote areas of southern Mexico, obtained a special legal protection (or amparo , in Spanish) exempting it from a fee  of around one million pesos (approximately US $50,000) to use the radio spectrum for its operations. This fee is typically assessed by Mexico's Federal Institute of Telecommunications  (the regulator for radio broadcasting and telecommunications) for corporate enterprises. ICT is a non-profit. The Collegiate Circuit Court on Administrative Matters, Specialized in Economic Competition, Broadcasting and Telecommunications ruled  that this does not exempt ICT from payment, but it does instruct the Federal Institute of Telecommunications to reconsider the required fee. As a not-for-profit, ICT argues that it should not be treated the same as the commercial service providers. In the ruling, the Court recognized that ICT's services relate to the defense of indigenous peoples’ human rights including freedom of expression. It also acknowledged that the pro homine principle  (pro persona) must be applied when reviewing human rights issues to encourage the broadest protection of individual and group rights at all times. Organizations such as Rhizomática  and Networks for Diversity, Equality and Sustainability  who helped establish ICT published a press release  welcoming the Court's decision and thanked supporters who joined them on this difficult journey. No puedes aplicar las leyes a rajatabla , tienes que ver cómo se ubica dentro del sistema, si es equitativo o no. We feel that the Court's ruling is a watershed in terms of the communication rights of indigenous peoples and communities and how the regulator [the Federal Institute of Telecommunications] should perform its functions. Article 1 of our Constitution states very clearly that all people shall enjoy human rights, without discrimination, and if there is any doubt, the interpretation of the rules must be done in such a way as to support the broadest protection of human rights. This interpretation is an obligation of the judiciary, and also of the executive and regulatory bodies. The Court's judgement is very good in that sense, since it indicates to the regulator that it has an obligation to interpret the law in support of human rights, and to consider the special situation of indigenous peoples and their specific rights to communication. In other words, the judgment indicates that regulators should not strictly apply a tax law [in this case, the one that determines what should be paid for the use of the radio spectrum] which would deny a basic right. For us, having to pay a million pesos would have meant that we would stop operating and the communities then would be denied their human right to communication, simply because of an administrative issue. You cannot apply the laws strictly, you have to see how they are in the context of the system, whether they are equitable or not. According to Huerta, the regulatory body has already issued a resolution to interpret the law in question, but a payment exemption will not be granted until ICT obtains the status of “authorized grantee ” by the Tax Administration Service, given to civil society organizations or trusts to receive tax-deductible donations. Given the situation, Huerta says that ICT may be forced to reject the Institute's ruling. Additionally, ICT filed for another special legal protection against inequity and discrimination in the process of granting licenses in broadcasting and telecommunications. Para radiodifusión, no hay pago del derecho por el uso del espectro, ni en concesiones sociales ni en las comerciales. Su derecho se paga en tiempos fiscales  [espacios de transmisión que ocupa el Estado Mexicano]. For broadcasting, there is no payment for the right to use the spectrum, neither for community licenses, nor for commercial ones. Their right is paid in the form of time periods that are reserved for public service broadcasting . For community and indigenous radio there is no payment in public service broadcasting. So, there should not be a required payment for the use of the radio spectrum for providers that are in the same category. If the same logic is applied here [to provide a social, community, indigenous service], the same provision must exist. Unfortunately, there are several examples in which, if it is to benefit a private individual with great economic power, everything seems very easy, even if principles are violated. In other cases, even where there is a judicial resolution, as is the case that concerns us now, the authority is very inflexible. These different parameters show discrimination. ICT, known for its independent, disruptive and innovative initiatives that follow in the footsteps of indigenous technology projects like the community cell phone network , has never wavered in its virtues and has vowed to continue to fight for indigenous rights. There are those who position themselves to support the powerful. We will follow the necessary paths, trusting that, in the end, what is privileged will be the rights of indigenous peoples and communities.